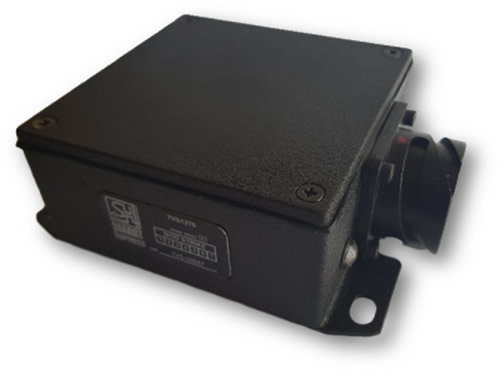 The SH-TVS-1275 is the premier protection device for suppressing transient overvoltage conditions in vehicles, mainly caused by load dump occurrences. Over voltage surges and spikes will be suppressed to ensure full compliance as stipulated in MIL-STD-1275D. To ensure full protection against transient overvoltage conditions, the SH-TVS-1275 is connected across the primary and/or auxiliary battery supply bus of a vehicle. The SH-TVS-1275 continuously monitors and clamps any spikes and surges to ensure a ’clean’ supply to sensitive electrical systems operating on the 24VDC power bus. An open collector digital output on the connector notifies a clamp condition. A second open collector digital output as well as a visual indicator lamp provides overall health status feedback of this unit. Clean supply to electrical systems operating on the 24VDC battery power bus. Digital output signals provide TVS ’clamp’ and ’health’ status. Protection of vehicle electrical systems. Ensuring MIL-STD-1275D compliance in vehicles. 38VDC maximum clamping voltage @ 100A. Operating temperature -30°C to +75°C. Physical size (mm): 130 x 92 x 43.5 (L x W x H).